KUALA LUMPUR (Sept 18): The FBM KLCI made last minute gains due to a technical rebound, helped by gains in banking shares. The KLCI closed 1.54 points or 0.08% higher at 1,845.32 points on gains in stocks like CIMB Group Holdings Bhd and Malayan Banking Bhd. Felda Global Ventures Holdings Bhd and Sime Darby Bhd declined. Lee Cherng Wee, JF Apex Securities Bhd’s senior analyst, told theedgemalaysia.com that investors had been selling shares on Bursa Malaysia ahead of the outcome of Bank Negara Malaysia's Monetary Policy Committee meeting today. Lee said many were looking at whether the central bank would raise the overnight policy rate (OPR) by another 25 basis points. Bursa Malaysia was mostly in the red as decliners outnumbered gainers, at 506 and 309 respectively. A total of 2.06 billion shares valued at RM1.84 billion changed hands today. Sumatec Resources Bhd was the most active stock. The biggest gainers were Far East Holdings Bhd, Lafarge Malaysia Bhd and Nestle (M) Bhd. Today’s biggest decliners included AEON Credit Service (M) Bhd and Syarikat Takaful Malaysia Bhd. Regional indices staged mixed performances today. Japan’s Nikkei 225 was up 1.13%, Shanghai Composite inched up 0.35% while neighbouring Singapore’s Straits Times Index gained 0.11%. 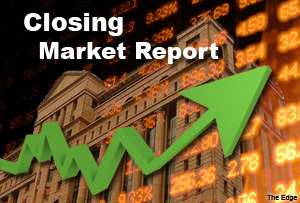 However, Hong Kong’s Hang Seng fell 0.85% and South Korea’s Kospi Index dropped 0.72%.